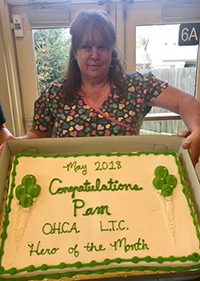 Pamela Anderson from Covenant Village of Green Township, Cincinnati, Ohio has been selected by the Ohio Health Care Association (OHCA) as its Hero of Long-Term Care for May 2018. 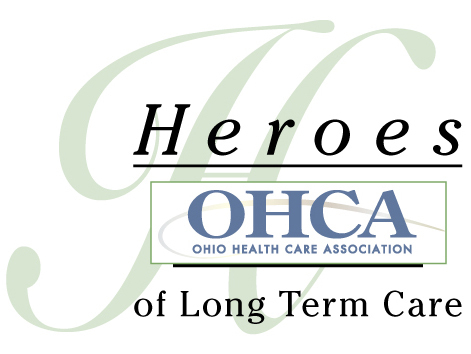 OHCA honors one long-term care employee each month for their service to caregivers, residents and the community. Anderson will be featured on the OHCA website (www.ohca.org) during the month of May, and will be recognized at the Association’s Annual Convention in Columbus, Ohio. Amy Mullowney, Licensed Administrator for Covenant Village, , says that Anderson is passionate about serving the facility’s residents and the community. "Pam is one of Covenant Village's most senior team members, and works the facility with great care and good humor," Mullowney said. "She is a valued asset to the Covenant Village team!" Anderson has worked in long-term care facilities throughout her adult life, and has been with Covenant Village since January of 2013. Outside of the facility, she shares her life with her children and grandchildren, and serves as the sole provider to her 7 year-old grandson. "Pam has endured the sudden loss of her daughter, a knee replacement and ongoing aches and pains. Through it all, she retains her good nature and sense of humor," said Julie Camele, Human Resources Director at Covenant Village. "On any given day you will see Pam interacting with the residents, cracking jokes on the floor and attending to the facility's social function. According to co-workers, Anderson is hard working and willing to help our wherever needed. "Pam is a woman of courage, grace, compassion and humor," said Camele." "This and her work ethic make her our Hero of Long Term Care!" Covenant Village of Green Township is a physical therapy rehabilitation center dedicated to getting its patients home faster. The state-of-the-art equipment, techniques and environments we employed are more than innovative. They are proven to make the road to recovery more pleasant and a faster route to get patients home, healthy and independent. Covenant Village is located at 3210 West Fork Road, Cincinnati, OH 45211; Phone: 513-605-3001. For additional information please go to www.hcmg.com/Facilities/Covenant-Village.aspx.